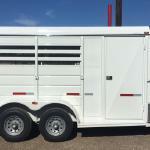 ​There are so many type of Horse Trailers to choose from. Not all trailers are in stock right away but can be ordered to satisfy your needs. Please call for more information. 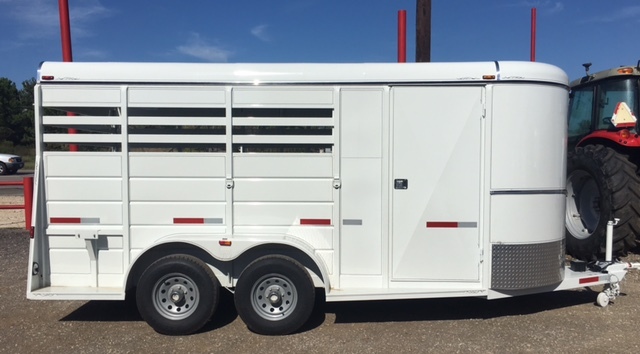 NEW 6'6" TALL WITH WALK IN TACK AND SADDLE RACKS & 7-BRIDLE HOOKS ON TACK WALL, TORSION BRAKE AXLES, FULL SWING REAR DOOR, SIDE ACCESS, 2-INSIDE AND 2-OUTSIDE TIE RINGS, V-CHROME AND GRAVEL GUARD, RUBBER MOUNTED WINDOWS IN FRONT.